My parents were happy recipients to the their 2-room rental flat from HDB, barely a few months after my birth. And it was in this little apartment where I grew up with my 3 older brothers, my parents and my grandmother as well. It was small, it was crampy but it was enough, and it was where some of my fondest memories were created. I would do my homework on the living room floor and when night came, I would just roll out a thin mattress over the same place to sleep. We survived, all 7 of us but slowly we had more space. 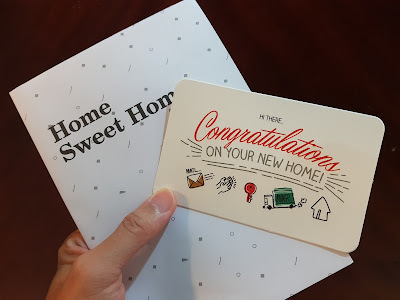 My older brothers got married and moved out, my grandmother passed on and then I bought my own HDB flat at the age of 23. We were so happy when we first got the keys to our resale flat. The space in the recently vacated apartment was considered HUGE for us, even though it was just a 3room apartment. I remembered I was really house proud back then, and would clean up our newly-renovated house every weekend. Every little blemish on the wall or floor was always taken care of by yours truly. Soon our little babies came along one by one. From newly weds, we finally became parents after 6 years. It was just a natural progression, and as we moved along in our parenting journey, we realized that our babies give us immense joy, far greater than what any inanimate material possessions could. So what if we have drawn or sticker walls, chipped furnitures or holes in our sofa? These does not matter anymore, so long as we had each other. Even Mark Lee cannot tahan the amount of stuff and the sticker wall made by the kiddos years back! We had been practicing co-sleeping with the kiddos since our first. I had never read up on articles related to this topic but we had been doing this all along because it just felt right for us. As irritating as it feels sometimes, the kiddos' requests to hold on to a part of us, be it our hands or legs before falling asleep, do give me the fuzzy feeling. At first it was just Steffi between the two of us on our queen-sized bed, and then Leroy came along. It was quite a squeeze when Stacci came, so we added another single-sized bed by the side to accommodate all 5 of us in our bedroom. Up to today, we are still able to accommodate our last kiddo Louie, and the 6 of us had been sharing one bedroom all these while! Although we were comfortable with our flat, we had dreams of upgrading to a bigger flat after we had our third child, BUT my wife left strict instructions for me, not move too far. We ever considered a jumbo flat in our block once, because that was our dream house and it was NEAR enough, but it was going for $810,000 and that required almost $100,000 in COV. We never had that sort of cash anyway. Then we considered a 5-room point block unit near our place a few months later too, but the wife finally decided that it was still better we stayed put, because our 3 kids were still young and we could still use help from our in-laws who are our neighbours just 2 units away. In the end, we finally decided to try our luck with a BTO project that opened up just a few blocks away from where we stayed. We applied under the Third Child Priority Scheme and secured our 5-room unit on our first try. At the point of our application, Louie was not even conceived yet and by the time we were supposed to collect the keys to our new flat, he was already over 3 years old! It would be just nice, now that the 2 boys get their own room and the 2 girls get one too. We thought that this would be it, that this would be our slightly bigger new home, with one extra bedroom, till the children grow up. But as luck has it, just weeks before my key collection, my immediate neighbour came by our place and asked me if I would be selling my current flat since he knew I had gotten my new flat. I told him that I would be selling my flat to my sister-in-law since she had indicated that to me before. On hearing that, he casually mentioned that he would have to look for a buyer for his flat instead as they were looking for a bigger place too. That was when the thoughts of having my own jumbo flat came about again! I knew it would be my last shot at owning one, and at a big financial cost too, but I know I had to give it a try, for me, for the family. Ater over a decade of staying in my 3-room flat, I finally bought a new flat, and became my own neighbour! So after many weeks of negotiations and uncertainties, we finally sealed the deal on the purchase of the 3-room unit from our immediate neighbour in the month of September this year. So we will be having our 3-room + 3-room mini Jumbo flat soon. It will be an expansion of our current place, without the need to pack up and move to somewhere unfamiliar. Having a bigger unit, without the need to sell my current unit and incur any resale levy. It was truly the best thing that could happen to our family now. We are so excited and looking forward to a brand new home after our renovations! Sometimes life may take you on a long winding road, cause much doubts and requires you to give things up. But who knows if it might still bring you just what your heart desires, albeit a little later?